The Black Entertainment Television ( BET) Honours are designed to promote and celebrate the achievements of African Americans across a number of fields. The show, in its fifth year, attracted the presence of not only musical royalty, like Stevie Wonder and Aretha Franklin, but also that of the political kind, with none other than Michelle Obama making an appearance! This year's musical honoraries included the Diva with the 5 Octave range, Mariah Carey. Not only did she receive an award for her contribution to music, but the lucky lady received two musical performances: one from Destiny's Child member, Kelly Rowland, and the other from musical legend Patti Labelle. I was expecting Kelly Rowland's performance to be lacking vocally and Patti Labelle to be amazing, but it was the other way round on the night. Kelly Rowland delivered a surprisingly spirited and youthful rendition of Mariah's Fantasy, hitting an effortless and strong F5 at 1.54. Being a deviation from the original melody it even appeared to take Mariah by surprise, who applauded her interpretation. But Ms Rowland wasn't done impressing yet, successfully going for the G5 head note, that Mariah holds after the song's bridge, and actually managing to hit an A5 in the melisma. For whatever reason Patti LaBelle's usual hurricane gusto wasn't present as she honoured her goddaughter. Her performance of Hero was almost despondent, rarely hitting a note in her signature, piercing, fifth octave belting range. 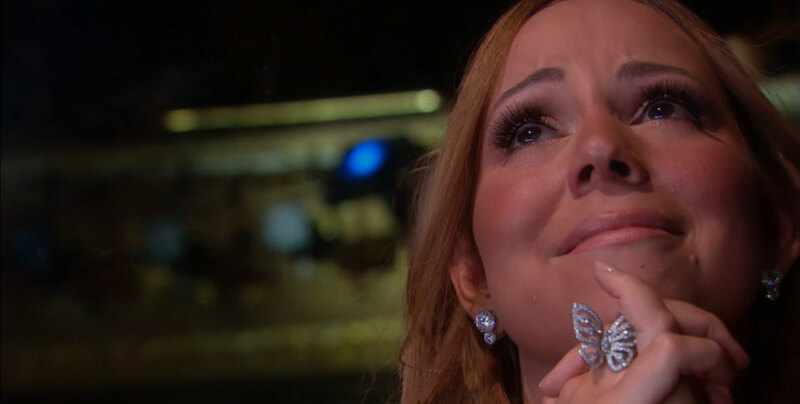 When it came to the bridge, where Mariah usually jumps an octave, Patti instead switched briefly to her head voice before quickly dropping back to the fourth octave to proceed through the rest of the song. There wasn't even a trademark C6 "Wooooooo". It was slightly unnerving to see Patti LaBelle so timid. Still, even though Patti's voice was kept in check for the performance, she still managed to make Kelly Rowland look like amateur hour at the local pub karaoke night, with the gravitas and soul of her performance. Mariah was clearly moved by the tribute, mentioning it during her acceptance speech: "Patti you just murdered me, I'm on the floor! I was crying from the second you stepped on the stage!" Ahhhh my fav diva....'Mariah Love' lol dear lord she looked delicious too! Agree with you about Kelly, her voice touched notes I had never heard from her and sounded pretty awesome. Impressive considering how intimidating it must have been to perform not only one of her classics but do so right in front of her. As for Patti - I will be honest with you DD I have never really known much of her until this site and maybe a couple of songs, but from what I did hear here I did enjoy the performance due to her restraint and concentration on the lyric (it also just about brought my poor wee heart to tears seeing Mariah so touched at her just being there) Overall I did find her version absolutely stunning. But yeh you have converted me to bona fide Patti fan, so thanks for that ;). I love Mariah too and its about time she started getting some recognition. I think out of all the divas, of that generation, she gets the least respect. Heck, I think even Beyonce and Lady Gaga get more and they're only young uns. I think its mainly because she doesn't act the part of a serious "musician" with her divaisms and over the top persona. But anyone who listens to the way she constructs her harmonies and vocals knows otherwise. Hopefully this will change, because she has accomplished so much, and continues to do so, in her career and deserves to be recognised for it! It states she is only second behind of Madonna in regards to female musical importance. I like yourself hope she gets more attention in regards to her superb songwriting and incredible voice! I also agree out of the three of that time she was disgustingly overlooked! Hopefully as time goes on she will get that recognition as you say! I seriously cannot wait for her new material to come out! Im so happy for Mariah for finally achieving some recognition. However...I was hoping she would be more humble and honest rather than having her current typical Mariah Ego take over. I mean i just miss the old Mariah that seemed more down to earth who never really spoke the way she does now. I just find it a bit annoying honestly, however thats just my opinion. Patti's performance was breath taking even though I could definitely see some restraint. I didn't particularly like her phrasing during the song though. I absolutely loved Kelly Rowlands performance of Fantasy. BOY can she sing I didn't even know she was so great with her head voice like that. It truly goes to show that some of todays pop talents aren't really showing us what they can do. I'm glad, and surprised, she charted second! She doesn't usually do too great. I'm guessing this was based on hits, or fan votes, because it certainly wasn't the critics ! Did you see Kelly Rowlands performance of Greatest Love of All at Alis70. She killed it. I think Kelly has finally gotten a vocal coach thats pushing her because all this performances shes been doing lately has just been slaying.